Pokemon fans have been trying to "catch 'em all" since the franchise's debut in 1996, but the uber-dedicated now have the opportunity to take home one of the rarest trading cards, for at least $50,000. 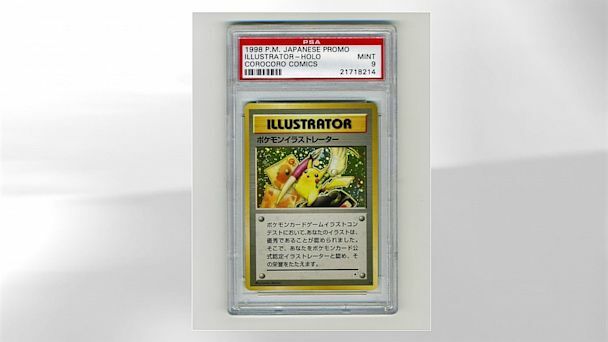 The Pokemon Pikachu illustrator is being auctioned off on eBay by Scott Pratte, a 26-year-old professional card collector. He says the "Holy Grail of Pokemon" has multiple reputable bids for more than $50,000, out of 450 total. The card, printed in 1997, was originally created as a reward for fans who submitted illustrations of their favorite characters. Only six of these cards exist and only four have ever sold, one for more $20,000, according to Bulbapedia, the Pokemon encyclopedia. While the popularity of the Pokemon franchise has seemed to decline since it was a cult phenomenon in the late 1990s, the market for the trading cards appears to be still booming. There are more than 70,000 cards and collections for sale on eBay alone. Nathan Hill, president of Hill's Wholesale Gaming, boasts about the continuing popularity and demand. "Pokemon is steady and consistent," he says. "It's so popular that it never goes down in value and the demand has always been there." Pratte says his Pokemon cards are often in greater demand than many of his sports cards. Pratte's card received a score of 9 out of 10 from the Professional Sports Authenticator, which qualifies it as "mint" condition. While a "9? is not particularly uncommon for modern cards, it indicates only "a very slight wax stain on reverse, a minor printing imperfection or slightly off-white borders," according to official PSA grading standards. "When you have a third party telling you that the condition is great, buyers are willing to pay a higher premium," Pratte said. The bidding is scheduled to end Sept. 18. Pratte even has another copy of the same valued card that he might auction off if this one is successful enough. "This is just a test to see if I should let go of the other one," he says. "If this goes well, it's really going to 'incentivize' me to sell the other." While it might take a while for a card to out-value this rare Pikachu illustrator, Hill of Wholesale Gaming predicts that this isn't the end of the pocket monsters, which will continue to thrive. "It's become a huge part of pop culture," he says. "It's going to be around forever."